Normally, when I take pictures of my cat, they end up looking awful – and not always because I've taken a "bad picture." My cat is solid black, so she blends into backgrounds or the lighting prevents her face from being seen. Or, more often, she looks like this. It's radioactive cat! Her insides are glowing through her eyeballs! But today, I finally got a lovely photo of my beautiful girl. 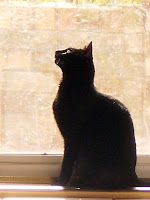 She was sitting in the sunshine at the front door staring at something fascinating – an invisible bug, no doubt. Isn't she lovely? I had to share. She just looked so sweet. Appearances can be deceiving. I spent New Year's Eve and New Year's Day watching a British sitcom I had never even heard of before this week. A friend showed it to us at one of our movie nights we have occasionally. Usually we watch bad movies, either Mystery Science Theater 3000 episodes or a fully awful complete movie that we make fun of on our own. But this time we watched something fantastic - Black Books. It stars Dylan Moran, Bill Bailey and Tamsin Greig and is set in a book shop in London. A terribly filthy and unkempt book shop run by a drunken Irishman and a man-child assistant. A friend of theirs hangs out in the shop between trying to find a job for herself. One of the episodes featured a banner for "International Children's Book Week." Bernard, the shop owner, and Manny, the assistant decide they can write their own children's book. As they're brainstorming ideas, they have this brilliant exchange. Bernard: No, not anything goes! I said no rules! Just a little something to keep you going. It's not anything goes; it's simply NO RULES.